All three ladies please email me your info so I can send you prize!!! please send it to: ahoefler@new.rr.com, this is Amy…she is my assistant and keeps track of everything! Now I could have charged you for these settings but…I didn’t want too, I like giving things away…but…I want to think that if you need more fabric to complete the setting you want you WILL order it from Primitive Gatherings..it’s hard to tell how much fabric you all have left from making your blocks…I told you what you will need to finish in these setting directions..so minus what you have left….AND if you don’t need more fabric, you will support me in other ways. It is a lot of work/time to make these FREE things happen…also if you notice on my blog…there are no ads…so the only way we make money to support ourselves and pay our employees is if you buy on our website, come to our booth at the shows…or ask your quilt shop to carry Primitive Gatherings fabrics, wools, wool kits, we also wholesale Valdani to other quilt shops…so if you ask your local shop to carry our things…this all helps!!! We sure appreciate all of you who make it possible for us to have jobs we LOVE! PS…I also didn’t move the blocks around in these possible settings, they are left in the order they were released…you can make decisions as to where they look best…also…one more thing…the borders in these setting are big on purpose…I want someone to do some applique…or some fancy quilting in those wide borders…you always can adjust the border with if you want a smaller quilt…I guess I could go on a on..so here’s the three setting’s…Have fun…I would love to know which is your favorite and why please leave me comments!!! 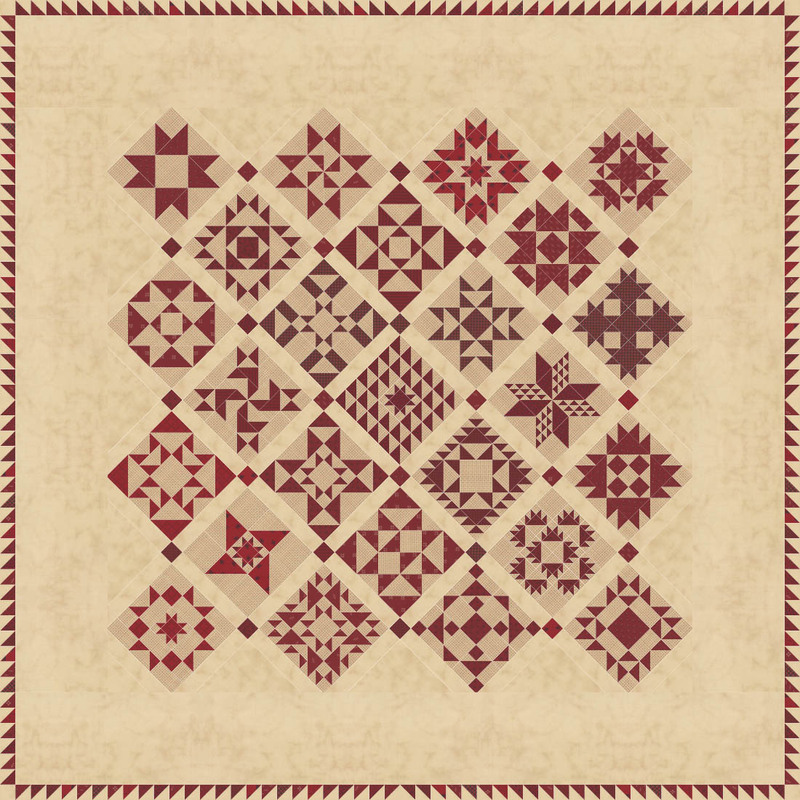 Next Post 12 days of Christmas…12 things Quilter’s shouldn’t live without!!! I LOVE setting number 1! I’m doing the country version. However, I love all three, so hard to choose! Thank you for all you do. I love version 1, it’s so open and airy, like snowflakes…red snowflakes in a white sky, I guess! Did I miss block 25? Lovely, lovely settings! I like setting 1 the best. It is beautiful in its simplicity, gives your eyes more places to rest, and really showcases the individual blocks the best, I think. Thank you, Lisa and team, for all the work you do for us! Thank you so much Lisa for this beautiful quilt. I can’t wait to start. 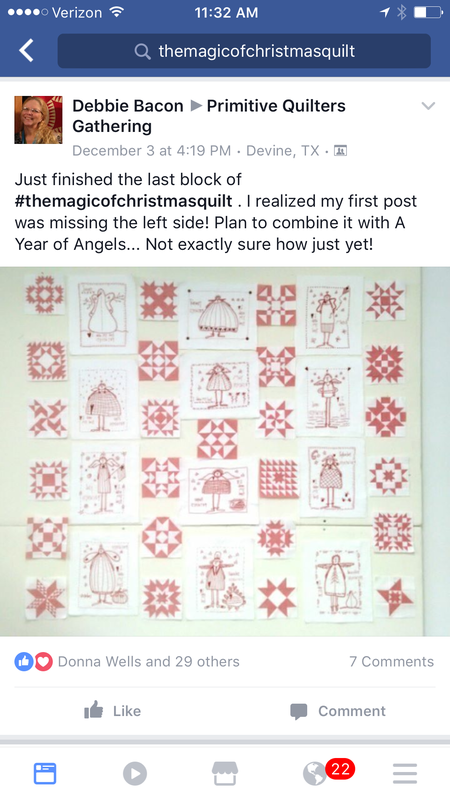 I retire on December 30th and plan on doing this quilt right away. Love the setting options. 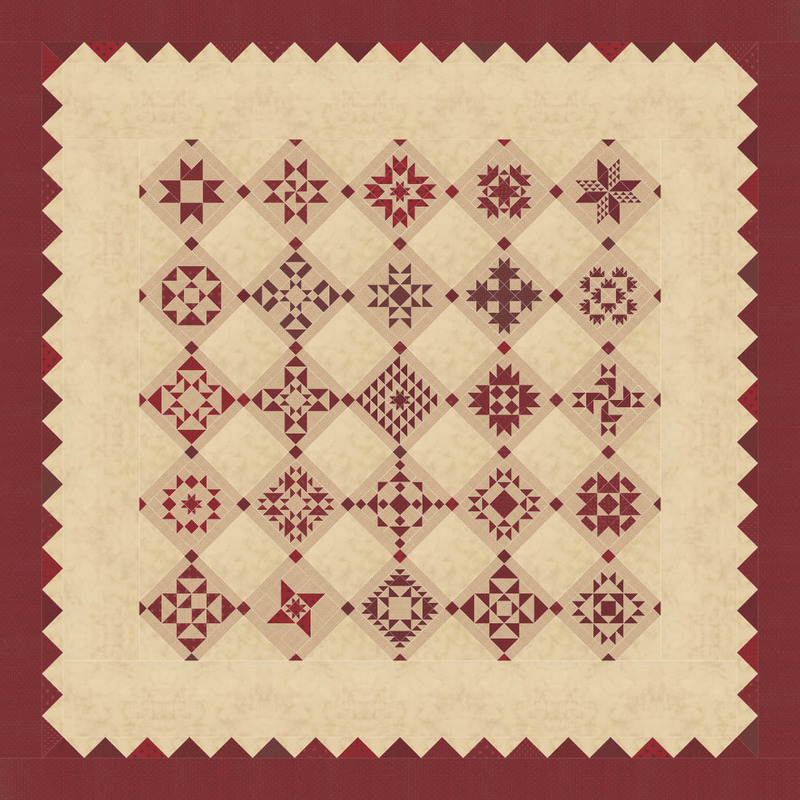 I have a personal mission to do a series of Red and White quilts and this will fit in great. Thank you so much again. Number three is my favorite. 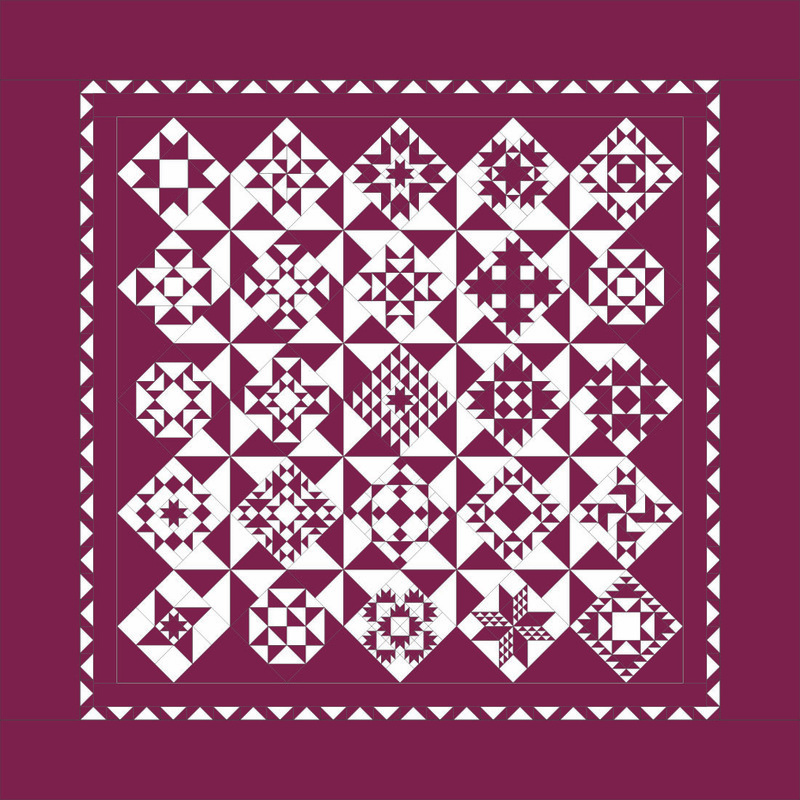 There is room for some beautiful quilting. It is a hard decision between the 3 designs. I really like version 1. I’m wondering how to quilt it. I’m already thinking of how to quilt it? Congratulations to all the winners.. Lisa, all of the settings are absolutely fabulous. Thank you for a great Christmas quilt. Hugs…. Number 3. Perfect size for a wall hanging above my steps Thanks for sharing your designs. I prefer setting number 2. The red is so rich. Will there be kits available? No question! Number two for me. 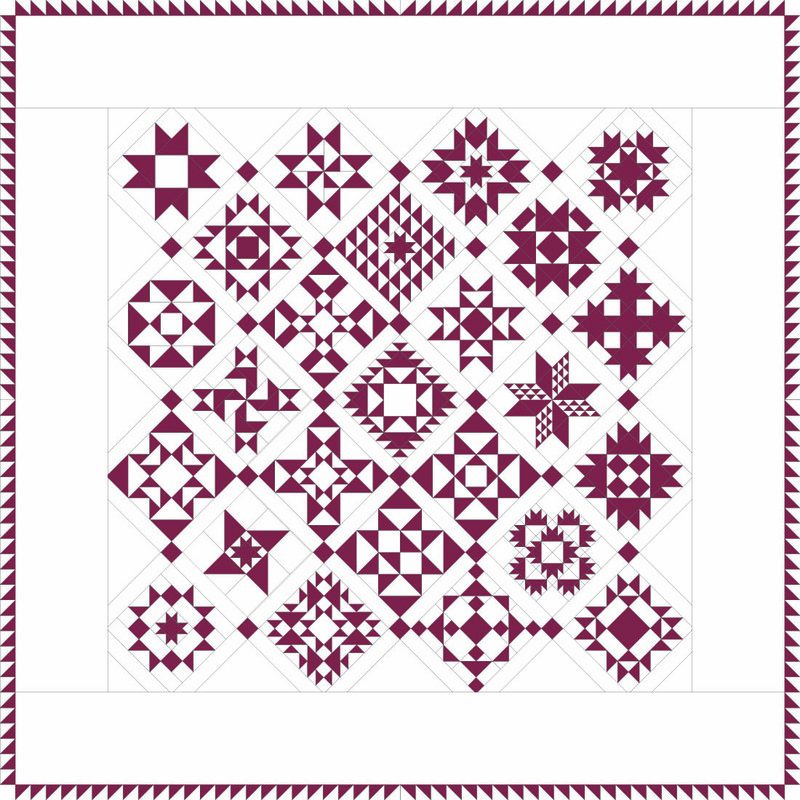 The fabulous pinwheel blocks for the secondary design and the pieced border….it’s beautiful! Thank you so much for the patterns and the excitement of the surprise through the season. These are all great but I absolutely love the embroidery of A Year of Angels added. Where can I find the embroidery patterns? I’m kinda partial to setting #3 … I forgot to mention that being in awe of the embroidery as well. I love the first and the third version perhaps a combination of the two would be what I would choose. First, thank you for this sew along. Second, I can’t decide which setting I like the best. Right now I like #1 and #3 or maybe I can do a variation of the two?! hmmm………..Merry Christmas! Setting #2 City Version. They are all so lovely but this one said Christmas to me. By the way could you please tell me for block #24 which version is correct ? is it 2″ or 1 3/8 ” in B or D ? I saw block #24 posted a couple of times but I was confused as to which one was correct . Thank you so much for your gift of blocks ! Merry Christmas. Thank you for choosing my blocks! I had fun with this! As for your settings, I choose#3 as my favorite! Oh my gosh! I love the #1 setting! Thank you so much for the wonderful blocks I had so much fun doing them. 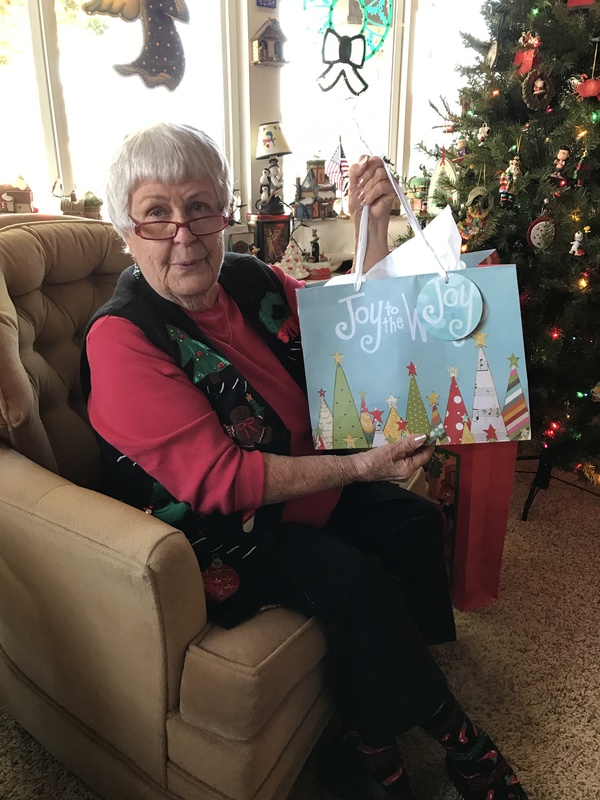 The Magic of Christmas was a way to end this year! Thanks again. Hard to decide which version to make! Thank you for all of the patterns and settings! Merry Christmas! Congratulations to all the winners! My favorite setting is the first version because to my eye, there is a nice balance between the red and white or cream. Thanks Lisa for sharing your time and talent with this fabulous free sew along. Thank you! It will be hard to choose, they are all GLORIOUS! You are awesome!!! Love the finishes and you are so generous in your giving of free projects and tips! Thank you and I will be ordering more fabric among other things!!!! Glad you are feeling better. I like number 2, the pinwheels remind me of peppermint candy. Thank you for all that you share with us. I really appreciate all your hard work that goes in to designing these patterns. You are always my first stop at the GRand Rapids AQS show! you have no idea how much I appreciate the NO ADVERTIZING! things that move, pop up, etc really bother my eyes! Love the free patterns and settings. Thank you so much! I love Version #2 because “I love lots of red” and I am going to be making the Country one. It seems the red border makes the beautiful blocks just pop! Thanks so much, Lisa, for the fun project and free patterns! I like setting #1. Each block is beautiful by itself, and #1 lets each shine as an individual without being too “busy.” And (sorry) I didn’t make any of my blocks yet, so by the time I get around to making them I will have lost these suggestions and will need to make up my own anyway. But I love them! Thanks! Thank you Lisa for these 3 gorgeous settings! I like #1 best. I love applique and will add some to that large white border. I’m so very proud of my first attempt at 6″ blocks. Thank you for this mystery and I’ll definitely be ordering some more of the fabric soon. Thank you so much! It’s been so fun making these blocks and I’m looking forward to putting them together in the new year or maybe even over Christmas break. Can’t decide yet which setting I’ll use but leaning towards version 1. Loving that Version 3! And that sawtooth border! We are crazy for tiny half square triangles! Thank you so much for this pattern, it has been a fun sew along. 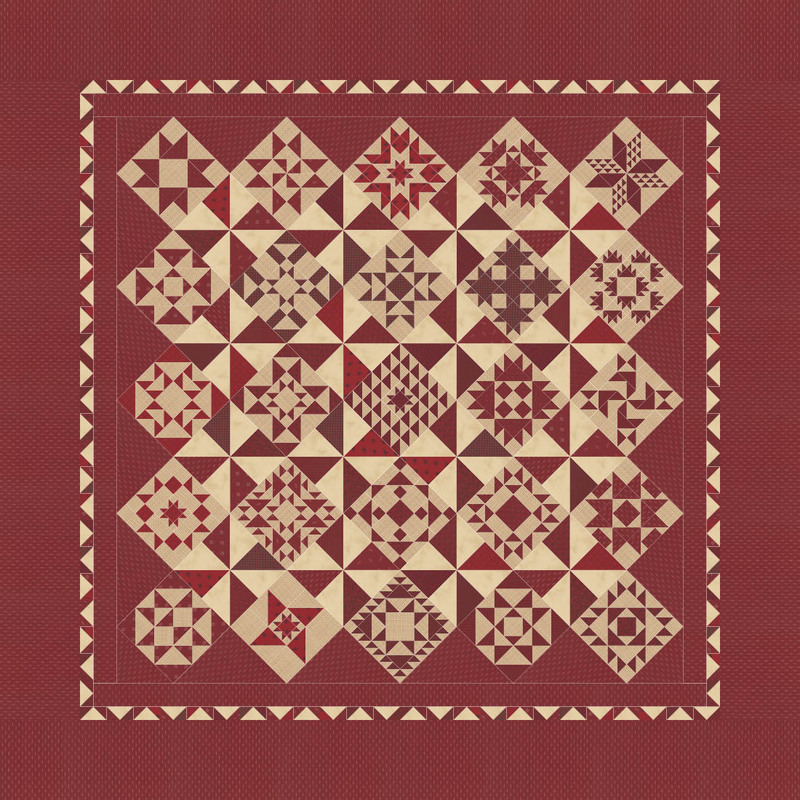 And what an awesome pattern, it will make a beautiful quilt, I love the idea of the border space for the quilting too! Thank you for all your hard work and what you do for quilting! Have a Merry Christmas! They are all winners it’s a hard choice thank you so much for the options. I may mix two of them together……!!!! I hope you are feeling better and have a wonderful Christmas. Let’s do one for V day next. Again ….a great project. I saved 1 and 3. Now I’m looking for applique options. I am voting for setting #2. It just speaks to me–but they all look really good! These are wonderful. Lisa, you are so generous with your time and talents. So glad that you are recovering nicely. 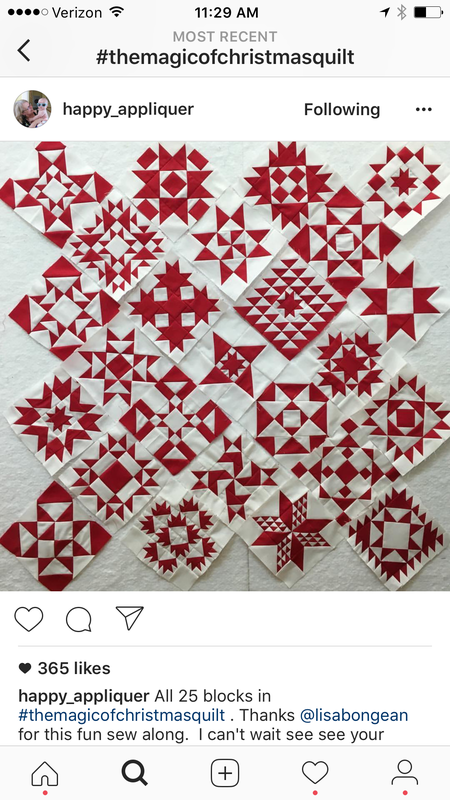 I’m doing the country blocks; for them I prefer setting #2′ but I almost want to make the another set of red/white and use setting #1. 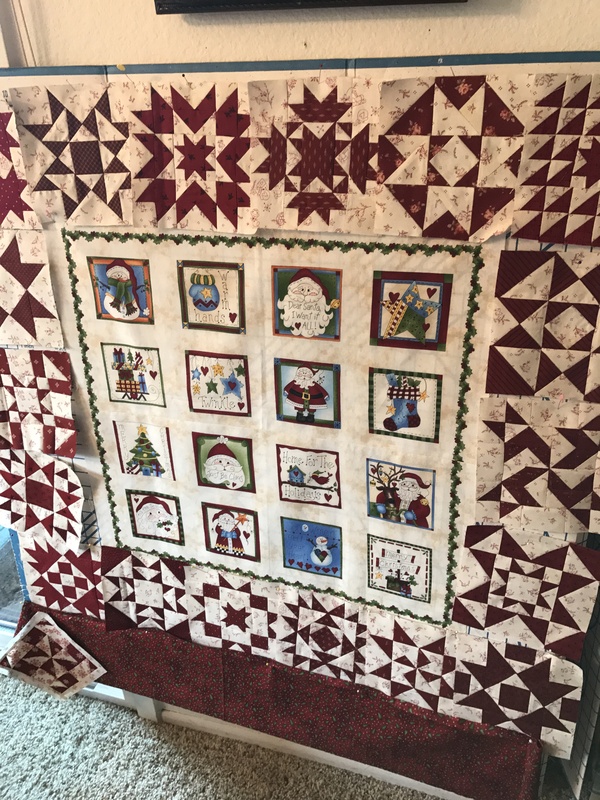 That looks like the perfect Christmas quilt! They are all wonderful. My favorite is 3. Thank you for all your hard work in making this happen. Number 2 just sparkles–love it. Thank you for another great project. These are fabulous settings. I think I’m partial to the prairie points. Not sure why though. Thank you, Lisa, for these patterns, and all your lovely work! And especially for all you share and how you encourage us to keep quilting and challenging ourselves. You are the best! Thank you Lisa! All 3 settings are fabulous! Even though I haven’t begun making any of the blocks yet, I know I will be using setting #! for my quilt! Thank you for such a beautiful quilt pattern!! So excited that my blocks were chosen as one of your winners. I just loved making them. 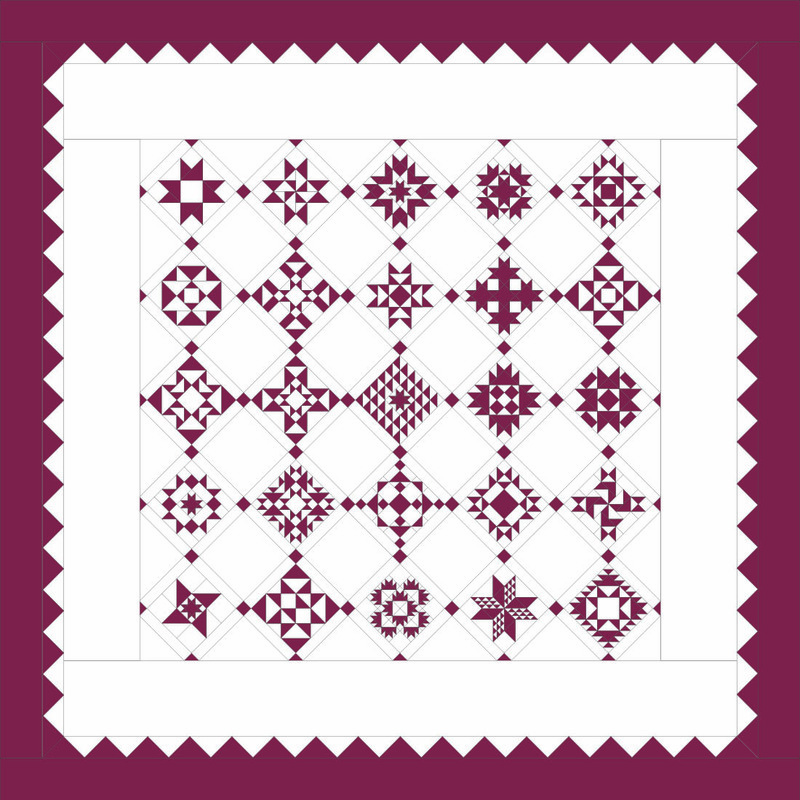 I think I will be combining the border from setting one with setting 3’s layout. And then adding another change of my own. I look forward to completing the top soon. Thanks so much for the great patterns. Love setting 3 Country Version – it’s comfy!!!! Setting 2 for me. Thanks for the gift of your time and talents. You are appreciated. They are all beautiful, but number one is my favorite. Thanks for all you do. You are very appreciated and admired! Hello Lisa, I have done the first 3 squares, got mad with these tiny pieces and then saw you recommend to use your half square triangle paper templates to paper piece the whole Iot. I would like to order the quantity necessary for the 24 squares of magic of christmas but how do they work? Is there a standard measure to use and then do you need to trim them to get the right size? And how to get the finished size of the square? I am sorry I can’t come to your place. I have a shop in Milan, Italy….. quite far away. Waiting for your answer. How long would it take to get your parcel here? Many thanks. I’ll be using version 3, except instead of half square triangles along the outside, I’m using Prairie Points. I’m afraid I can’t face another half square triangle! But I need to get cracking as I need to have it assembled, quilted and ready for binding by Friday noon! I like #1…it will look wonderful in my cabin all year long. Thank you for all the little things I learned as I worked on these blocks. It’s THERAPY!! What a lovely Christmas gift. These are all lovely settings. Thank you, Lisa, for a beautiful quilt!. Merry Christmas! I love #3. It’s simplicity is stunning, and I can picture all that open space filled with beautiful quilting. Thank you for conducting this sew along. I learned so much and enjoyed making all of the blocks. My favorite is setting #2. I will finish my version in the red -tan scrappy version. It would also be great done all scrappy in a variety of repro fabrics. Thanks for this sew-along. I love it!! Thanks so much for the free patterns, appreciated all your hard work to make this possible. I printed off setting no. 2, have 6 more blocks to make. Merry Christmas. I can not lie. It’s impossible to make up my mind. Each of the settings are great – even from the regular to the Country they look different. Thanks for these wonderful blocks and the wonderful setting instructions. Merry Christmas – may this be the best ever. I’m trying to decide between number one and three…..I like the light backgrounds. What a terrific pattern….thanks so much. I am a huge fan and have many of your projects/kits in progress. Merry Christmas and thanks for the gift. Thanks, Lisa. They’re all beautiful. It’ll be hard to decide which to choose. Merry Christmas! Thank you so much for doing this quilt. I love all the blocks and I love the country and city version. I haven’t started yet and can’t decide which way to make it. Such fun decisions to make. Thanks again! Thank you so much for this, Lisa!! I received my prize yesterday! Thank you so much. Now that Christmas is in the rear view mirror I might be able to work on putting the blocks together this weekend! Happy New Year, Lisa.